"The best years of service are before them, and they are more than ever in a position to meet any needs of their customers." 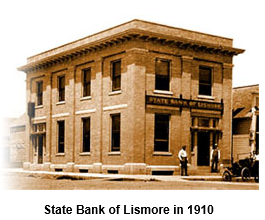 An impressive history parallels the activities of the State Bank of Lismore, now in its 101st year of business. 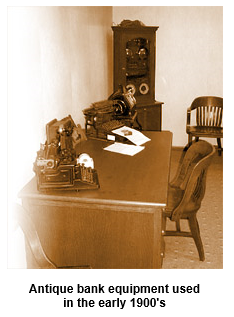 Some of the earlier memorabilia includes the original alarm system, clock, posting machine, interest calculator, old oak office furniture, all refinished, including a standup desk, telephone, file cabinet and work tables, as well as earlier history and pictures. All of this can be viewed in the bank’s museum located in the bank’s lower level. When the Rock Island Railroad, Burlington Line, chose to lay track for new townsites in 1899, the northwestern Nobles County site of Lismore began to grow in earnest. Pioneer businessman, Emil Graf, Senior and A.J. 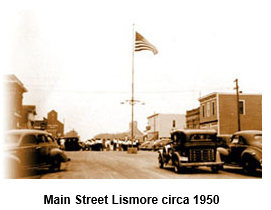 Rice, were predominant among those who developed the town site and organized the State Bank of Lismore in 1900. Emil Graf, Sr. had lived in Stein-on-the-Rhine, Switzerland for ten years, one of two children of John J. and Margaret (Strasser) Graf. He was born March 22, 1839. In April of 1849 the family left Germany and set sail from France for “the new world”. They arrived in New Orleans in 34 days, and settled in the St. Louis area. In June 1850, the family decided to relocate in Minnesota territory. After his discharge from the First Minnesota Regiment, where he had served between 1861 and 1864, and his marriage to Frederica Zeb of Philadelphia, the family homesteaded in Wilmont Township in 1879. They eventually took up residency in the Village of Lismore in 1900, where Mr. Graf was one of the active founders of the town. A.J. Rice was born August 28, 1856, a descendent of the American branch of the Rice Family who were among the early settlers. Of Scotch-Irish ancestry on his mother’s side his boyhood days were spent on a farm near Whitesville in Allegheny County, New York. He attended school there and learned the pharmaceutical trade. At the age of 20 Mr. Rice came to Nobles County arriving in Worthington in September 1876. After one year he moved to Adrian where he opened a drug store and later engaged in the real estate business. He was active in county affairs and served a four-year term as County Commissioner. During these years Mr. Rice resided in Adrian but worked energetically for the development of the western end of Nobles County. The first officers of the bank included President, Emil Graf Sr. who served from November 19, 1900 to November 20, 1912; Vice President, Charles R. Rieckhoff; and Cashier, A.J. Rice. The Board of Directors were A.J. Rice, James S. Ramage, Emil Graf Sr., Charles Mylius and Charles R. Rieckhoff.. On the 9th of March 1901, the bank had capital stock of $15,000 and deposits were $16,500. At the annual stockholders meeting on November 18, 1908 it was voted to erect a new building. 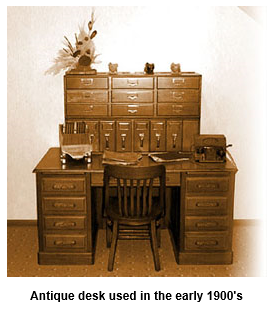 Some of the stockholders present were Emil Graf, J.C. Graf, A.J. Rice, Fred Pank, Allen E. Higgins, E. Brickson, and C. Koslund. In 1910 the bank moved into it’s new brick building, a two-story structure 25 x 50 feet, with a full basement. In November 1912, A.J. Rice was elected President with E. Brickson as Vice President and F.J. Forkenbrock as Cashier. On May 14, 1913 the capital stock was recorded at $25,000, surplus $5,100 and deposits of approximately $146,000. 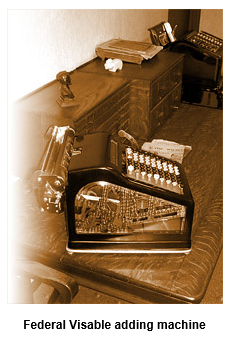 In May 1914 L.A. Loosbrock was elected Assistant Cashier. The State Bank of Lismore celebrated it’s 25th year of faithful service to the people of Lismore and the surrounding vicinity on December 1, 1925. At that time the capital stock was at $25,000 with surplus and undivided profits $7,000 and deposits totaling approximately $33,000. The bank grew through good and bad times, and ranked fifth largest in the County in 1925. On June 21, 1923 R.R. Sell was elected Assistant Cashier and A.J. Rice continued to serve as President of the bank until his death on August 4, 1939. After the death of A.J. Rice, the bank continued to enjoy growth under the newly elected President, L.A. Loosbrock. Leo A. Loosbrock was born July 27, 1892 in Dyersville, Iowa. He was the son of Mr. & Mrs. John A. Loosbrock who later settled in the St. Kilian area around 1904. After finishing school in Dyersville, Leo attended business college in Dubuque Iowa. Among his varied interests were the Lismore Cooperative Telephone Company of which he was secretary, and the Wilmont Fire Insurance Company where he served as secretary. Leo married Clara Hebig on June 26, 1917 in St. Kilian. He and Clara had five children: Marvin, Balyon, Dulcee, Thomas and Marilyn. 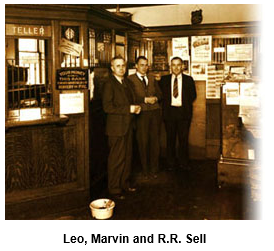 Marvin T. joined his father in the banking business in 1937. After thirty years of service in the State Bank of Lismore Leo A. Loosbrock died July 8, 1942 at the age of 49 after a year long battle with cancer. Following twenty years of employment, R.R. Sell followed Leo A. Loosbrock as President of the bank, elected November 18, 1942. Rob Sell was also a native of rural St. Kilian, he was born July 31, 1898, the son of Robert and Mary Tabbert Sell. He graduated from Mankato Business College, and married Isabelle Thompson on June 21, 1923. They were members of the First Presbyterian Church in Lismore where he served as an Elder for many years. Rob and Isabelle had two sons, Robert and Glenn. R.R. Sell continued in the Presidency until November 20, 1974. His wife, Isabelle preceded him in death in 1975 and Rob passed away June 14, 1989. The first major renovation of the State Bank of Lismore took place in 1971/1972, when the second story of the building was removed. It had housed the Lismore Cooperative Telephone Company’s office for many years, and was used as living quarters for the operators and their families. An additional 20 x 24 feet was added to the existing structure and was completed April 24, 1972. Personnel at the time included Marvin T. Loosbrock, elected President on November 20, 1974; R.R. Sell, Vice President; Marlus Johnson, Cashier; Mark Loosbrock, Assistant Cashier; and Virginia Henning, Bookkeeper. 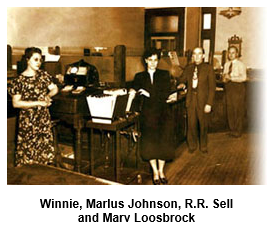 With the exception of a tour of duty with the U.S. Army between 1943 and 1946, Marvin served in the bank in various capacities for fifty-three years. He and Lois Trautt were married June 25, 1945. The couple had three boys, Gary, Steven, and Mark. Marvin was active in many organizations in the community including a lifetime member of the American Legion Post 636 where he served as the finance officer, the Lismore Fire Department, the City Council, and the Lismore Cooperative Telephone Company where he served as secretary. He was also vitally interested in, and active in the Church of St. Anthony, serving as Coach of the St. Anthony High School Chieftains Basketball Team for over twenty-five years, and he was a member of the Knights of Columbus. Two of Marvin’s sons joined him in the bank, Mark in 1972 and Gary in 1975. Marvin died March 10, 1990 after a short bout with cancer. Mark was elected President and Gary Vice-President on November 21, 1990. 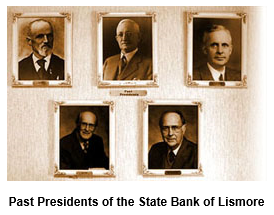 The bank currently has 8 employees including three fourth generation Loosbrock’s. The bank is currently staffed by: Mark Loosbrock, President; Troy Loosbrock, Vice President; Ellen Henning, Cashier; Andrew Loosbrock, Assistant Cashier; Jennifer Brake, Operations; Tyann Prins, Operations; Barry Sauer, Insurance Manager; and Matthew Loosbrock, Insurance Sales. Having celebrated their Silver, Golden, Diamond Anniversaries and our 100 Year Jubilee in December 2000, the State Bank of Lismore continues to experience growth and to develop additional services for the customers in Lismore and the surrounding area. These words written about the bank in an article in the Lismore Free Press dated December 1, 1925 hold even greater meaning today…. "The best years of service are before them, and they are more than ever in a position to meet any needs of their customers."